There are countless ways to make a sugar foot scrub. You don’t have to pay department store prices to enjoy beautiful skin. These recipes are easy to make, and they can be made from items you may already have in your kitchen. These skin treatments can be used on your feet, face, hands, arms, legs, and back. They can be used in the shower, as part of your current beauty routine, or as a stand-alone activity. You don’t have to rush and use it all up. 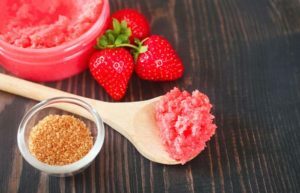 Once a sugar foot scrub is put together these homemade beauty products can last up to two months. Just be sure to put them in an airtight jar. Wet your skin using warm water. You can use either a bowl and washcloth, or you can turn on the shower and step in for a minute. Apply the sugar scrub. You don’t have to use a lot of the sugar scrub but try to get an even coating across your skin. To get a good exfoliation, use firm massage strokes. Don’t press too firmly. This process shouldn’t hurt. Rinse the sugar scrub. Use the shower, or bowl to rinse away any excess sugar scrub. You don’t want to use any soap or shower gel as this will wash away the oil. Pat your skin dry. Vigorous wiping could remove the oil and while you will have exfoliated your skin you will lose the moisturizing effects of the oil. For the maximum benefit. Follow up the sugar scrub with a little bit of moisturizer. If you have used it on your feet, putting on a pair of socks can help lock that moisture in. Granulated Sugar is the base for all these recipes. 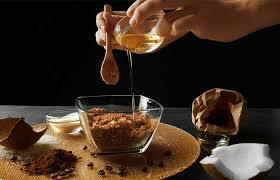 It is a good idea to use organic brown sugar, but it is not necessary. Process: Place the honey into a bowl. Add a spoonful of sugar at a time making sure to mix the ingredients after each spoonful. Continue adding and mixing until entire cup of sugar is mixed in. Store in an airtight container for use. Process: Mix all three ingredients in a bowl and store in an airtight container for use. When using the sugar scrub be sure to scrub so the flower petals break apart and release their own natural oils. Process: Mix the milk and hot water so there is enough to soak your feet. Soak for 10-15 minutes. Mix sugar in the raw and white sugar and then a little bit of coconut oil until you have a thick paste. Store excess sugars and oil in an airtight container. Process: Mix ingredients in a bowl and store in an airtight container for future use. Process: Mash strawberries and mix together with sugar. Add in olive oil. Store in an airtight container until needed.